Leader of the Islamic Revolution Ayatollah Seyyed Ali Khamenei has called the US “the embodiment of evil and violence” whose existence relies on encroachment on other countries’ sovereignty. 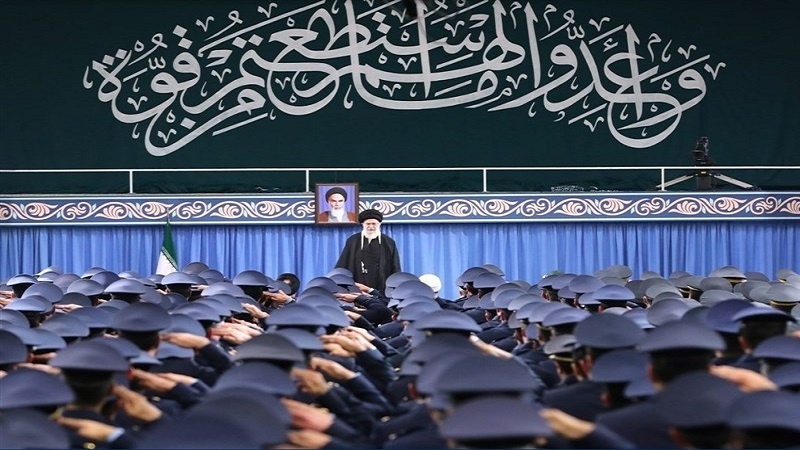 “The US regime is the embodiment of evil and violence; a crisis-maker and a warmonger,” Ayatollah Khamenei said in a Friday meeting with a group of Iranian Air Force commanders and personnel in Tehran, Press TV reported. “The US regime’s existence has always … depended on encroachment aimed at securing its own interests,” he said, adding the Iranian nation will keep chanting “Death to America” as long as the United States remains evil. “The US is the embodiment of evil, but still complains why you chant ‘Death to America’,” the Leader said, referring to US President Donald Trump’s remarks about Iran in his State of the Union address Tuesday. “First of all, I should tell the American officials: ‘Death to America’ means death to Trump, [US national security adviser] John Bolton, and [US Secretary of State Mike] Pompeo. It means death to American rulers who are currently these individuals,” Ayatollah Khamenei said. Every year on February 8, Iranian Air force commanders and personnel meet the Leader to mark the historic allegiance of Iranian Air Force officers with the late founder of the Islamic Republic Imam Khomeini back on February 8, 1979. The meeting is viewed as a turning point which led to the victory of the Islamic Revolution three days later, sealing the fate of the US-backed Pahlavi regime in Iran. Ayatollah Khamenei also dismissed Europe’s human rights accusations against Iran, saying European countries are not in a position to criticize the Islamic Republic. “In the streets of Paris, they attack protesters and blind them, and then shamelessly make human rights demands on us,” the Leader said, referring to Yellow Vest protests which hit France for the 12th straight weekend. “Do you even know what human rights are?” Ayatollah Khamenei said, addressing Europe. “They never knew what human rights are either today or in the past, and even throughout their history,” he said of the Europeans. The Leader further pointed to Europe’s package to save the Iran nuclear deal, which was recently unveiled by France, Germany, and the United Kingdom, urging Iranian officials not to trust the Europeans. “The Americans were not trustworthy … and I had urged our officials not to trust the Americans’ promise, smile, and signature; the same applies to Europe,” Ayatollah Khamenei warned. “I don’t say we shouldn’t have ties with them; I’m talking about trust… They cannot be trusted and respected; we’ve witnessed it many times; France in one way, Britain in another way, and the others in their own ways. “Of course we currently have and will have relations with the entire world – except for some exceptions – but we should know with whom and on what we are making deals,” he added. “Negotiations with the Europeans should not be cut off, but we should not wait too long for a European package and instead, we should do a lot of work inside the country,” Ayatollah Khamenei said at the time. Ayatollah Khamenei also called for further unity and solidarity among the Iranian nation ahead of nationwide rallies Monday to mark the 40th anniversary of the Islamic Revolution. “22 Bahman [Feb. 11 rallies] is no place for settling scores,” the Leader said, urging participants at the rallies to avoid chanting slogans against certain state officials.